KMF partners with local groups, the private sector, government agencies, and non-governmental organizations in Canada and Africa to mobilize the human, intellectual and other material resources that is required to provide the primary healthcare needs of impoverished communities. KMF does this through medical supply missions and support to local level project initiatives in Africa. KMF provides and delivers healthcare resources, and educational materials to communities and institutions in Africa, and works closely with professionals in Africa in its fight against infectious diseases. KMF believe that in this 21st Century no child should be left behind becasue their parents cannot afford to provide them with the essential learning tools. 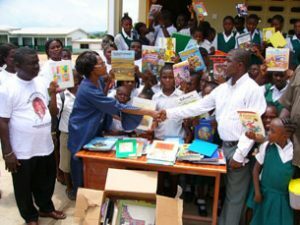 Through our Elementary School “TOOLS 2 LEARN” Programme, we provide general school supplies, educational materials, books, computers, and other multi-media equipments which gives children in Africa and Third World countries an opportunity to excel in their academic learning. KMF is an organization founded by aspirator and main architect, Rev. Dr. Kay Morris, who has been guided by a deep, firm and strong conviction of God’s true message to mankind, and hope for deliverance of the unfortunate, through both spiritual and material intercession. KMF came about as a result of Kay Morris – a multi award winning international gospel artist musical work in Africa. 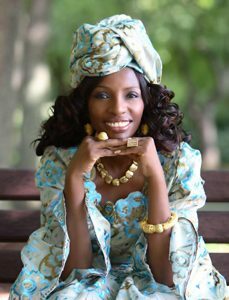 Kay’s music preceeded her in Africa; after going there and seeing the plight of the people in need, she decided to use her gift of music to effect change. Her music, through the Kay Morris Foundation (KMF) is to ensure that the under-privileged receive the basic medicine, food, education, and clothing. Her first mission to Africa started in April 2004, when she traveled to Ghana bringing with her medical supplies, and donated medicine to HIV/AIDS patients at Korle Bu Hospital HIV/AIDS Fever’s Unit, the UNHCR Liberian Refugee Camp, and the Ghana AIDS Commission. 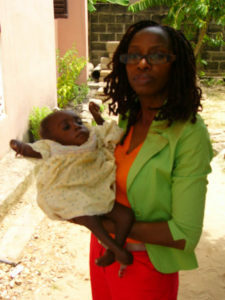 She made a hughe impact in Africa in 2006, after brokering a large donation of anti-retro viral drugs for Ghana, West Africa. 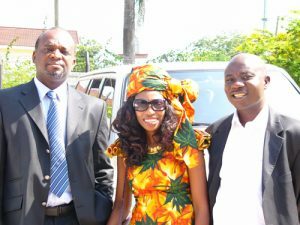 In honor of her humanitarian contributions, the King and people in Berekuso enstooled her Queen Nana Oye Sika I of the Royal House of Berekuso, Aquapem Ghana. Kay Morris is a World-Changer and a great visionary! Her ministry has brought her all over the world allowing her to cross racial, cultural, and religious barriers sharing compassion and the message of God’s love to many Nations. Despite the challenges that sometimes comes in organizing the missions, with God’s help Kay overcome and carries out each life-saving mission, going into some very remote areas of Africa, bringing hope to the hopeless and giving a voice to the voiceless. Apart from her humanitarian initiatives, Kay also mentor many youths in Africa and other parts of the world. It is to be noted that Kay’s advocacy work is not limited to Africa but locally she also feeds the homeless in The Region of Peel and donates food, clothing, and toiletries to Women’s Shelters in the City of Toronto. Kay has also carried out humanitarian missions in Caribbean countries such as: Jamaica, Barbados, Grand Cayman, and Guyana – South America. Commitment & Dedication: All foundation members will be dedicated and committed to the tasks assigned to further the growth of the KMF foundation. Members will do the necessary research and promotion to promote the awareness of KMF. Honesty: Members will be honest with one another, donors, and people interested in knowing about KMF. Donations will be accounted for at all times.